Questioning continued by Brian Panish(Jackson attorney) Questioned 18 Jurors in the “Box” Jurors box, process of elimination will be used, this is still early stages. As each seat is vacated another of the 59 available Jurors in court will take the seat, if none are dismissed, then that is who the jurors will be. Please also read “Voir Dire” to understand this process more. 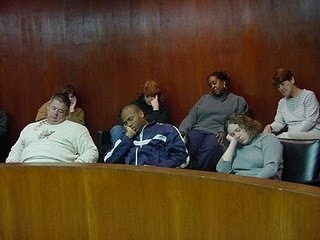 Please note it was hard to see which Juror No. was being questioned as we were sat behind them in a huge court room of over 400 seating, we will update Juror No.s if and when we know who they were. Juror 14 Female, continued from day 1, thinks some lawsuits against companies are unfair as it is abuse, and done to make money, but this is not at all the case in this trial, does not think Michael abused power as celebrity. Is willing to listen to evidence to reach a fair judgment, has guardianship of one child from one sister, one other sister had issues also but did not discuss it, felt one of her sisters who was a abusing narcotics had had time taking responsibility for her actions, which frustrated the Juror. But can set all issues aside to reach fair judgment in this trial. Heard lots in media, boyfriend also talked about things relating to Michael, found it hard to believe, but can set all these aside to reach fair judgment. Juror? male. RE: MJ Death- had some believes, was told some and he had heard in the media, can put all that aside. Was in involved in two lawsuits, was plaintiff, which were not very good experiences, was asked if he could follow instructions given, replied yes, but as stated to the judge has issues with work. Hardship-was told judge will address that. Has never been a juror previously, asked what his views were on dependency off prescription drugs. Is it easy to come off? Requires will power only? Or takes a lot of work. Replied he felt it was more difficult. Juror? Female. Cancer Research. Is scheduled to go to George Washington uni. Been doing research in UCLA. But classes, training and coursework haves been at work placement. Said she is not liberal in her views and thinking, but has common sense. Has two family members in the entertainment business, her daughter was too, until she passed away. Will not lean towards AEG just because they are in the entertainement industry. Has three things she wants to discuss in private at some stage. She lost her child, did not file any lawsuits in connection to the death. Asked if this lawsuit would have any effect on her judgment. Said NO. Asked, $$ wont bring back the person gone are you ok with the case, Yes. Said she had seen coverage about the death of Michael and AEG. But can put all that aside. Said she was experienced in setting aside one issue to deal with another. Juror 17 no one involved in prescription drugs in family, friends, did have a lawsuit bought against her Mother, but can set that aside when judging this case. And will not lean towards favoring the defendants. Hesitated,, then said, if the case is proved is ok with awarding large damages. Has daughter whose arm broke at age one and half years, took her into ER but Doctor diagnosed she did not have a broken arm. But daughter could not move her arm, was in pain, took her back to ER different doctor did an Xray diagnosed the arm was broken, first doctor misdiagnosed. Attempted to contact attorneys to file a lawsuit but they would not take it. Will not let that affect her judgment in the present trial. Served on one jury before was a criminal trial. Can decide on case that has not been decided yet until it is heard. J? husband works stater brothers, put on her questionnaire, sometimes people blame others for bad mishaps happen, bad things happen., but can’t say that is happening in this case because wants to wait and see the evidence. Says at times is conservative because she drives a 99 Toyota. Is more conservative then liberal on political views. Has general outlook not influenced in deciding this case, no opinions on MJ. Didn’t know he was addicted prescription drugs. Feels addictions needs a lot of help to 0ver come, with programs, and depends on case scenarios, some may be able to pull out of it easer then others.. had a Aunt who could not come of addiction without help, does not blame her aunt for being addicted. Has seen few media reports on this case, but didn’t pay attention. Husband has studied online Carolina. Not against whatever action the case is about because she will base her decision on evidence, cant award large damages if no evidence of claim. Can go other way if evidence presented. Juror 8. Male. Replaced previous juror No. 8. Father is a pediatric works with children. Juror is a banker working on helping mostly dentist with financing. Helps start up for Doctors. Went to school in Utah. Had a general discussion with his father when Michael Jackson passed away. an over view of who was wrong or right in Michael Jackson’s death. Respects his father’s opinion. Is member of Church of Latter–day, which plays a big role in his life, has nothing against Wrongful Death Lawsuits if it is backed by evidence. Juror 9. (was also questioned day 1) Male. Stock broker for 10/11 years. Was business student when he took his father’s advice to research into buying/selling shares. Viewed MJ as an entertainer trying to grab attention, which is not a bad thing, all entertainers do that. Is not influenced in any way to judge the present case. Has no problems with MJ’s relationship to his Mother or children. Juror 13. Male. Teacher at Velmont High School, as Head coach, had previously played football professionally, 2 yrs in Europe(“Start-up” league before NFL was formed), High School, and Collage. Asked if any lawsuits were filed against any football teams when he was a footballer, replied NO. is ok with lawsuits, has never been involved in any lawsuits himself. If evidence shows he is ok with lawsuits. Practices football at nights since he has been on jury service. Would consider Wrongful Death Lawsuit if some close to him died, if he had evidence. Can apply law in assessing a case, as a teacher had learned children often blame others for their guilt, but does not think so in this case. Had a friend who was addicted to prescription drugs after he left professional football scene. Feels it’s not easy to come of addiction to prescription meds, need help. Still in touch with friend. Heard bits and pieces about 2005 trial has no negative feeling about it. Was himself in Immigrations court for over 10 years. Feels the system works. Marvin Putnam for AEGLive, AEGLive Productions, Randy Phillips and Paul Gongaware addressed the 86 Jurors. Putam- Who has heard of AEG? One person replied, they are concert promoters were putting on a show at 02 arena. But had not heard of them before. One lady replied she heard they were bringing a football team to LA. Putman joked around, trying to be a likeable person, Jurors bought into it at first, then they were bored with his lame jokes. “well im not a football player” pointing as his skinny physical appearance, then repeated it a few times more. After Lunch the same continued, then he went into peoples job descriptions, what they do, how they do it. How one person test drugs, what system she uses, One person works on barriers, water barriers, he explained the technic of opening the barrier, cleansing the water, sea water, tunnels, OOOOOOOO MM GGGG, then we closed for the day, I have 14 pages of notes not worth typing. Asked if anyone had heard of Murray, EVERYBODY had, asked if anyone thought AEG were guilty, NO One did, as NO one had heard of AEG but two people. Its plain and simple for even an idiot to see Putnam, AEG have an agenda, and that is to draaaaaaag this trial out for as long as they can, I am surprised the judge did not put a HALT to this nonsense, I felt like saying, “STOP ALREADY” It was plain to see how completely frustrated the jurors were with this pointless disply, and wasted hours, no doubt Friday will be continuation of the same, which we will NOT be attending, Putnam also tried to change some of the minds of Jurors who replied to Mr Panish, you can see the replies above or on post of Day 1. Putman was also dictating the law to the jurors which really is the Judges right, Panish did object, but it was over ruled. Few Jurors did not agree with Putnam, they said, once a case is filed, if it has no merits it does not go to trial, so Putnam explained the law to them.